Cheng, S.J., Shi, F.Y., Liu, H., Ding, Y., Jiang, S., Liang, N., Gao, G., 2017. Accurately annotate compound effects of genetic variants using a context-sensitive framework. Nucleic acids research 45, e82. Latchman, D.S., 1997. Transcription factors: an overview. Int J Biochem Cell Biol 29, 1305-1312. Huang, Q., Whitington, T., Gao, P., Lindberg, J.F., Yang, Y., Sun, J., Vaisanen, M.R., Szulkin, R., Annala, M., Yan, J., Egevad, L.A., Zhang, K., Lin, R., Jolma, A., Nykter, M., Manninen, A., Wiklund, F., Vaarala, M.H., Visakorpi, T., Xu, J., Taipale, J., Wei, G.H., 2014. A prostate cancer susceptibility allele at 6q22 increases RFX6 expression by modulating HOXB13 chromatin binding. Nature genetics 46, 126-135. Liu, N.Q., Ter Huurne, M., Nguyen, L.N., Peng, T., Wang, S.Y., Studd, J.B., Joshi, O., Ongen, H., Bramsen, J.B., Yan, J., Andersen, C.L., Taipale, J., Dermitzakis, E.T., Houlston, R.S., Hubner, N.C., Stunnenberg, H.G., 2017. The non-coding variant rs1800734 enhances DCLK3 expression through long-range interaction and promotes colorectal cancer progression. Nature communications 8, 14418. Boyle, A.P., Hong, E.L., Hariharan, M., Cheng, Y., Schaub, M.A., Kasowski, M., Karczewski, K.J., Park, J., Hitz, B.C., Weng, S., Cherry, J.M., Snyder, M., 2012. Annotation of functional variation in personal genomes using RegulomeDB. Genome research 22, 1790-1797. Coetzee, S.G., Coetzee, G.A., Hazelett, D.J., 2015. motifbreakR: an R/Bioconductor package for predicting variant effects at transcription factor binding sites. Bioinformatics 31, 3847-3849. Fu, Y., Liu, Z., Lou, S., Bedford, J., Mu, X.J., Yip, K.Y., Khurana, E., Gerstein, M., 2014. FunSeq2: a framework for prioritizing noncoding regulatory variants in cancer. Genome biology 15, 480. Kumar, S., Ambrosini, G., Bucher, P., 2017. 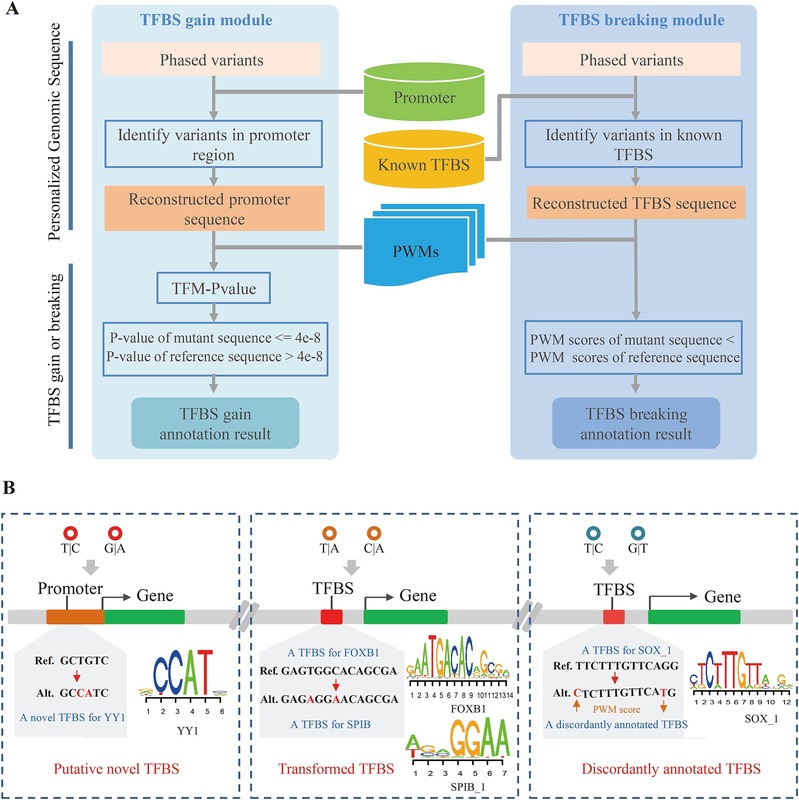 SNP2TFBS – a database of regulatory SNPs affecting predicted transcription factor binding site affinity. Nucleic acids research 45, D139-D144. Ward, L.D., Kellis, M., 2016. HaploReg v4: systematic mining of putative causal variants, cell types, regulators and target genes for human complex traits and disease. Nucleic acids research 44, D877-881. Zuo, C., Shin, S., Keles, S., 2015. atSNP: transcription factor binding affinity testing for regulatory SNP detection. Bioinformatics 31, 3353-3355.